Here’s three wild horses, aka mustangs, from the Pine Nut Mountain Wild Horse Herd Management Area. There’s been a lot of precipitation this past year and so there is a bumper crop of forage for them to eat and plenty of water. Under the Public Rangelands Improvement Act of 1978 it says that our public servants in the BLM and US Forest Service etc., must continually monitor the range resources and adjust interests, presences such as the wild horses accordingly. This means that the wild horses should be allowed to increase in number here in the Pine Nut Range now that there is such an abundance of forage and plenty of water, not be slighted, forgotten about … Those of us who truly care about and appreciate them must stand up for their rights, so that those who fail to appreciate them and their freedom and place in the natural world do not prevail, or get their nefarious, wild-horse-enemy-like way. 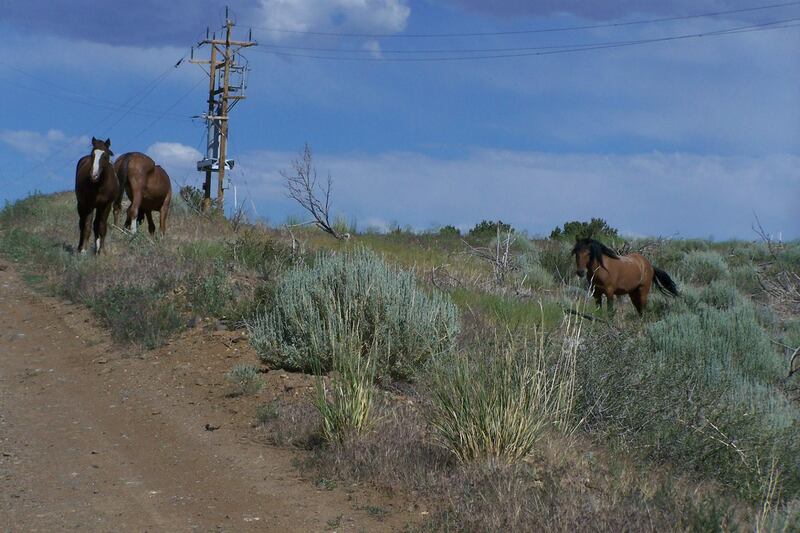 These horses, by the way, are under the jurisdication of the Carson City BLM Field Office whose number is 775-885-6000. They are located at 2730 North Deer Run Road, Carson City, NV 89701. The name of the Wild Horse and Burro Specialist is John Axtell and of the Mr Ralph Thomas, Carson City Field Office Manager, whose direct number I have as 775-885-6151.